What are you doing on your summer holidays?? How will you be spending your Lazy Summer Days?? We want to see it reflected in your project this week! Every year my family road trips east to my favourite part of the country. Home of red mud and Bud the Spud. You got it, Prince Edward Island (or PEI for short). We hit the beaches, eat lobster and mussels, soak up the sun and breathe in the awesome ocean air. I asked a friend of ours to send me some PEI road maps after we came back from the island last year, my intention was to use them on vacation scrapbook layouts. Sooooooo....that didn't happen (yet) but I did use one on this card! The two dies I used on the card were also brought home from the island last summer, I bought them from a lovely lady in North Rustico who sadly was closing up shop last summer. While you are there, please share some crafty lovin' with the rest of the crew!! Love this! What a perfect card for you to make. :) I keep waiting for the LAZY part of summer to kick in!!! How fun! You really embodied "lazy summer days" in this card... perfect! I know what you are doing this summer, awesome idea and a fabulous card, love those dies. 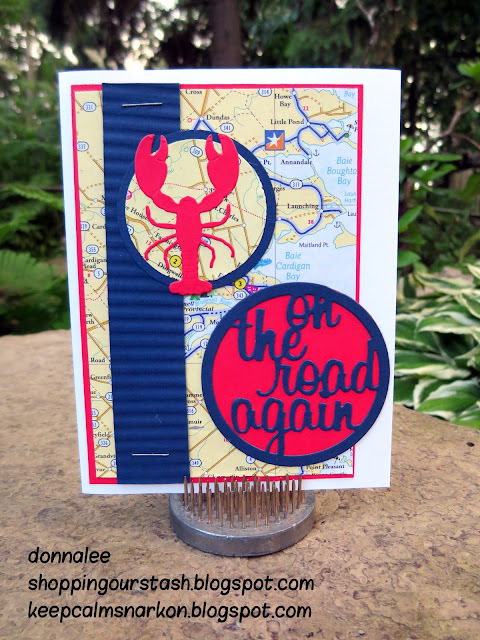 Donna, what a great idea to use an old map as your background, I must stop throwing old Road Atlas away, fantastic and eye catching lobster die, love how you highlighted it and your sentiments with the die cut circles.